PHOTO BY STEVE PHILLIPS Lakota’s Dylan Moes competes during the Division III-A race at the Cross Country Carnival at Hedges-Boyer Park in Tiffin Saturday. Moes placed 23rd. 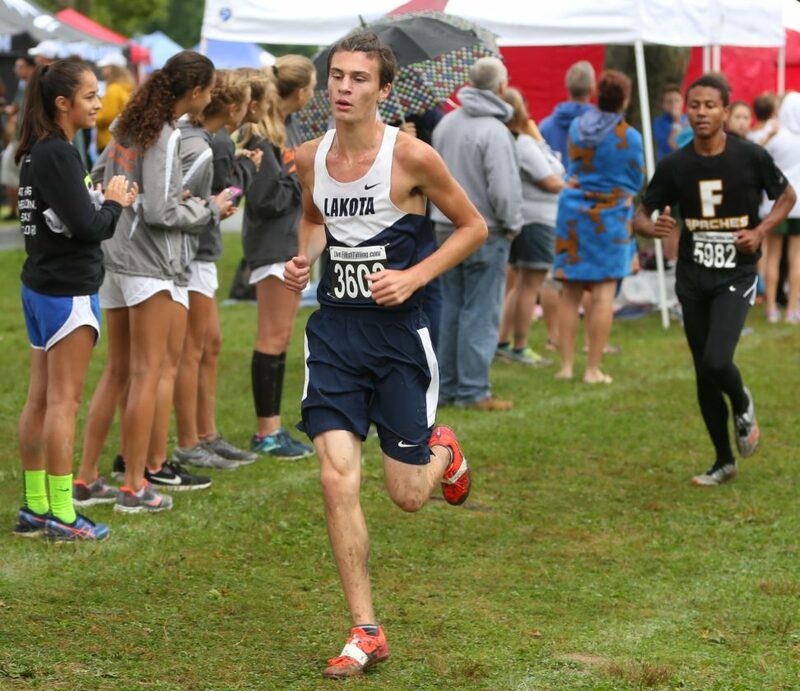 A mixture of wet conditions and the top competition in Ohio and surrounding states made the boys races at the Tiffin Cross Country Carnival tough for local teams. Hopewell-Loudon had the best team finish in the Division III Open by taking fourth, while Seneca East was eighth in the Division III-B race and there were a handful of Top 25 finishers. Mount Gilead ran away with the Division III-A race with 96 points, beating Columbus Grove (175). Lakota took 14th (446), while Hopewell-Loudon finished 16th (477), New Riegel placed 23rd (632) and Old Fort was 31st (727). Dylan Moes led Lakota in 23rd, crossing the finish line in 17:02.4. “I got out pretty fast because everyone goes out really fast in the first mile, so I did that. When I hit the two-mile mark at the bridge I began to surge where I pick things up a bit and try to pick people off,” Moes said. “Slowed down a bit before the hill and then for the last 800 I kept pace and then sprinted the last 100. The downhills were harder than the uphills, definitely. It was a good race. Connor Hill was close behind Moes in 40th (17:29.5) for the Raiders and Braden Schaser ended 79th (18:07.9). Hopewell-Loudon’s Jordan Foster ran in 46th (17:37.9). It also got a 75th from Carter Ritchey (18:04.9). Bryce Hohman led New Riegel in 64th (17:53), while Zach Williams added a 125th (19:03.5) and Old Fort’s Gregory Steyer (18:29.4) and Garrett Havens (18:30.3) were 99th and 100th, respectfully. Caleb Skidmore led the way and the rest of the Tigers bunched up nicely to get eighth with 259 points in the Division III-B race. Sandusky St. Mary dominated the race with 41 points. Skidmore crossed the line 12th in 18:13.9. The other four Tiger scorers were Dakota Laughlin (39th, 18:56.5), Shayden Heiser (48th, 19:04.7), Pieter Wise (74th, 19:46.7) and Reece Niedermier (94th, 20:15). Mohawk finished 15th (435), while Calvert was 23rd (563) and Buckeye Central took 24th (569). Mohawk got a 63rd from Brock Brause (19:33.2) and an 82nd by Isaac Ward (19:59), while Calvert’s Garrett Spaun finished in 51st (19:12.7) and Chris Laney placed 99th (20:22.6). BC’s Alex Young was 79th (19:53.3) and Justin Dentinger ended 95th (20:17.5). In the Division III Open, Minster won with 49 points, edging Columbus Grove (52). H-L had 104 points, while Lakota was fifth (176), Seneca East placed seventh (200) and New Riegel finished eighth (202). Sam Meade led H-L in 16th (19:44.7), while Connor Roush added a 25th (20:00.1). Lakota’s Mark Statham crossed the finish line in 36th (20:15.7) and Justin Miller tacked on a 38th (20:17.7), while Christian Drown (20:34.6) recorded a 49th for Seneca East and Matt Chappell finished 52nd (20:35.3). New Riegel’s top runners were Nick Zoeller (59th, 20:47.2) and Joseph Tiell (65th, 21:00.5). Columbian had enough runners to fill spots in each of the three Division I races Saturday. The best team finish for the Tornadoes came in the Division I-B race with a 23rd-place finish with 634 points. St. Xavier got the win with 29 points. Cole Newlove was the top finisher in the race for TC in 54th in 18:13.4. The Tornadoes also got a 102nd from Logan Robinson (18:47.7). Clyde had 849 points and placed 32nd as a team. Leaders for Clyde included Noah Curbelo (121st, 19:02.1) and Derek Mahler (146th, 19:16.8). The top finisher for Columbian overall came in the Division I-A race, where sophomore Caden Groves claimed 17th in a solid time of 16:25. Columbian finished 25th with 629 points. St. Xavier won with 96. “From the top of my head, I think (Groves) was top 60 as a freshman (at last year’s Carnival) and I thought coming into this year with all of his hard work — he’s done everything he’s been asked to do. If I tell him to do something there’s no complaints he just does it and I think he sees the fruits of his labor. Jacob Marquis added a 131st (17:49.5) for the Tornadoes. “I thought it was a great race. We were getting out fast, which it was the fastest we’ve gone out all year to this point,” Kihorany said. “We are just getting to that two-mile mark and pushing hard after that. Training is going really well, so there is nothing to complain about there. “I wanted 10-12 (personal records) and I think we got right around 17. I can’t really ask for much more. “The course was in great condition, so I mean there is nothing to complain about there. You have one bad muddy spot going down the hill, but the guys ran well and we did a good job. It was a great performance all around from everybody. Perrysburg won the Division I Open with 42 points, while Medina was second with 65. Columbian ended 30th (949) right behind Clyde (912). Grant Gribben was 239th (20:46.6) for Columbian and Josh Fanning finished 354th (21:41.5). For Clyde, Brody Stockmaster was 249th (20:50.7) and Owen Brewer ended 319th (21:23). Bay won the Division II Open with 23 points. Bellevue was 15th (534) and Upper Sandusky placed 18th (603). Noah Alda led the Redmen in 108th (20:38.7), while Damien Stull was 126th in 20:59. Trever Daughenbaugh ran 132nd (21:05.2) for the Rams. Brody Williams added a 145th (21:18.7). Bellevue beat out Upper Sandusky 689-700 for 22nd in the Division II race. Fostoria placed 43rd (1,220). For Bellevue, Zach Cleveland led the way in 38th (17:22.5), while Cayden Adams finished 55th (17:34.9). Troy Mawer led Upper Sandusky in 76th (17:57.1). The Rams also got a 103rd from Micah Harris (18:15.3). Fostoria’s Dylan Sheets ran 104th (18:17.3) and Dominic Jackson ended 263rd (20:51.1).